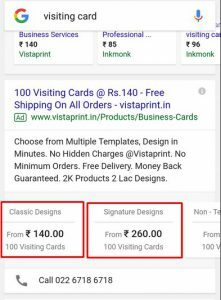 Price extensions - How to enable them in AdWords? 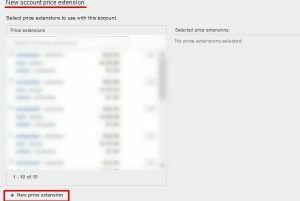 How to enable Price Extensions in AdWords? Price extensions are an AdWords feature which allows advertisers to include prices of their products in the search ads. 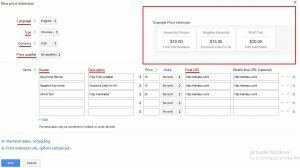 Similar to extensions such as location, product, site links, call, etc., price extensions display your business offerings in details. An ad with a live price extension on a laptop is shown in the screenshot below. An ad with a live price extension on a mobile device is shown in the screenshot above. 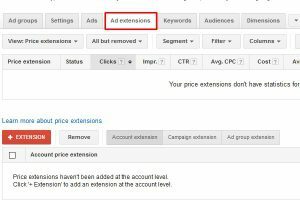 Advertisers can allow price extensions for ads by following the simple steps listed below. 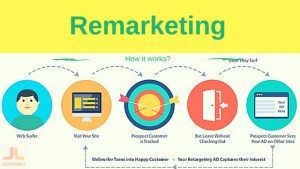 It is recommended that you do this with the assistance of a professional if you are new to AdWords. Note: Price extension can be set at account, campaign and ad group level. At account and campaign level, your price extensions could be more generic. However, at ad group level, they can be specific to a particular product or a group of products. Hence, you need to plan out strategically as to at what level you want to use the price extension. Once you have decided this, follow the steps listed below to enable price extensions. 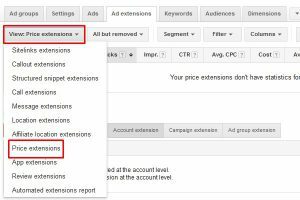 Log in to your AdWords account and click on “ad extensions” tab. Then click on “view” tab and select “price extensions” from the drop-down menu. You can also adjust the level (account, campaign or ad group) of the extensions from the tabs on the right. I have selected “account extension” to add the price extension at the account level. You can select campaign or ad-group as per your need. When adding a new price extension, you will see a window with various fields. It looks like in the screenshot below. Specify the language of the extension, extension type, currency and the price qualifier. In the screenshot above, language is the language you want your ad to be shown in. I have explained different types of price extensions below. Currency is the currency you are selling your products in. You can use price qualifier to if your prices are flexible. The header is the title of your ads. The description is a brief explanation of your product. Final URL is the landing page you redirect users who click on your ad. Note: A minimum of 5 rows of extensions is good. Header and description each can be up to 25 words. Final URL need not be unique for each row, neither the mobile URL. Hit “save” once you are done filling up all the fields. 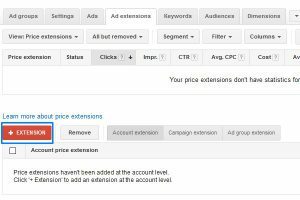 What are different types of Price Extensions in AdWords? There are 9 types of price extensions, and Google has laid out specifications for each type of price extension. Below are some of the relevant specifications for each type of price extension. Brand headers should be real brands that you offer. Headers shouldn’t contain anything other than the brand names. The description should provide more information about that specific brand. Event headers should relate to specific events (event date, event venue, event type, or performer name). The description should provide details about that particular event only. Locations headers can only be those places that are relevant to your business. The description should provide details about that particular location in the header. Neighborhood headers should be sub-regions or districts within a city or region. The description must provide further information about that particular neighborhood. Product headers can be different variations of a product category. And the description of a product header should provide further information specific to that product category. Product tier headers could either be levels or sizes. The description should add more information about that tier to help viewers under the product better. Services headers must be levels of services. The descriptions are best when they provide further guidance on each service tier. Service category headers should contain types of services. For a service category header, the description should provide further information about that particular service. Service tier headers are variations of a service category. A service category includes several specific services. For such headers, the description is helpful only if it provides further information about that service category. Price extensions provide detailed information to users and help them make an informed purchase decision. And the fact that they tip the scales of metrics like click-through rate and cpc also stands true. At AdNabu, we recommend our customers to use the price extensions, especially, when the shopping season is just the corner. 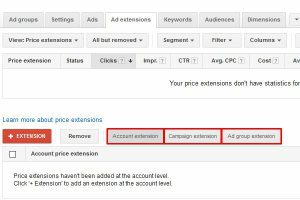 How to enable Callout Extensions in AdWords? How to stop Internal Competition within an AdWords Account?